The event is part of the city’s efforts to increase its walkability by giving the community a reason to head out, walk and enjoy the streets. The initiative was further taken a notch higher with the partial road closure of Paseo de Roxas, one of the busiest streets of Makati, for the culinary street experience. Despite the downpour of rain, the streets came alive as people actively used the pedestrian-friendly streets to enjoy the mouthwatering food, feel good music and entertaining activities for kids. Friends, couples and families alike simply walked around to take part in the exciting activities the Makati Block Party offered. From 4:00 in the afternoon until 10:00 in the evening, Paseo de Roxas, the stretch between Ayala Avenue to Makati Avenue, became a haven for all foodies and families who came to enjoy the block party. The streets were filled with cheerful vendors who served up their signature Salcedo Market offerings, from American, Persian, Italian to all-time favorite Filipino artisanal delights and hometown delicacies – name it, they had it! Given the hip community vibe that is distinctly Makati’s, the gastronomic festival was also filled with lots of fun, engaging activities. Kids had the time of their lives with the activities Kids on the Block prepared. Creativity and innovation were unleashed through art sessions, story-telling, crown and instrument-making, upcycling and more. When it was time to meet and greet their favorite characters Snoopy and the Lorax, everyone’s faces showed that excitement was hard to contain! To cap off the night and pair the sumptuous food with great ambience, Block Party-goers were treated to the jazz musical stylings of Vince Lahorra’s Quartet and the soothing voice of acoustic performer Johnoy Danao. 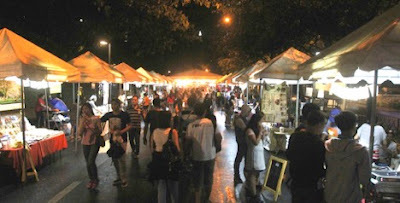 “We feel very happy that the first Makati Block Party was well-received by the community. It has been our goal ever since to keep the people closer through projects and events that can make everyone come together in one place. 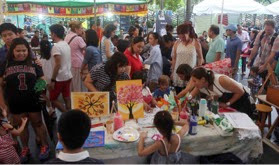 This culinary street party is just one of our efforts to encourage the people of Makati to use the streets more and make them realize that there are a lot of undiscovered experiences just around the corner,” said Shiella Aguilar, Project Development Manager of Makati. The Makati Block Party once again proved Makati as the one-stop destination for the best food, quality entertainment and extensive lifestyle offerings – all just a few blocks away. “Makati is one of the most pedestrian-friendly cities in the country and we will definitely continue to take advantage of this by pioneering events and activities that people will surely enjoy,” said Aguilar. Participating food vendors were Pinoy Ordurvs, Down To Earth, Uncle George Gourmet, Plaza Ilocandia, Monster Burger, Sabor, Bun Appetit, Elbert’s Sandwiches, Dela Rosa’s Deli, La Cuisine, La Reina, Real Girl Toy Kitchen, Old Fashion Tapa House, Bibingka, Al Halabi, Jiro’s Lechon, No Fat No Glory, Llanes Farm, Delicane, Authentic House of Curry, Mgourmet, Merry Moo, Johanna’s House of Lumpia, Gostoso Piri Piri, Rafik Shawarma, THC, Don Churro, Mangong’s Bagnet, Michelle’s Homemade Putong Ube atbp., Grace Pate, Rita’s Kitchen, Bersi Gyros Shawarma, Tuna Town Seafood Place, Stanford Shaw Brew, Cheryl’s Cuisine, Margarita’s Paella, Antipolo Delicacies, Bats Tilapia, MCV Trading, Haici Food Services. Kids On The Block activities by Hunt and Gather included Painting with Learning on the Gogh, Crown Making with Little Luli, Decoupage and Upcycling Activities with La Pomme Home, Free Play and Active Fun by Playworks ECC, and Science, Art and Music with Hedcen. To know more about the city that makes it happen, visit www.makeitmakati.com or like and follow Make It Makati on Facebook, Twitter, and Instagram.